Dotty Floral Printed Plus Size Essential Shirt is rated 4.6 out of 5 by 16. 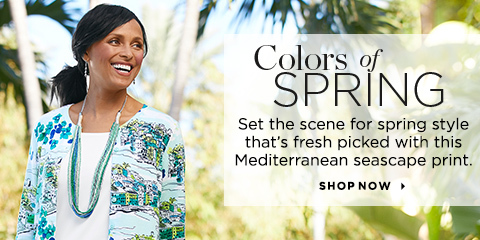 Featuring a colorful floral pattern, this playful woven shirt is so easy to dress up or down. It's outfitted with button-flap chest pockets and flattering princess seams, while tabs on the sleeves let you roll them when the weather warms up. Dotty Floral Printed Plus Size Essential Shirt is rated 4.6 out of 5 by 18. Rated 5 out of 5 by Sylvia1950 from Love, love, love This classic blouse. It is so colorful n cheerful to wear. It fis well...true to size. So many colors that this blouse will go with so many things in your wardrobe. Just right for a nice spring or summer day. You will get many compliments when you wear it. I know because I have. I paired the blouse with a pair of gray slacks. I felt well dressed and very much 8n touch with spring. Rated 4 out of 5 by Marty1945 from Very comfortable Only thing keeping it from a fifth star is that it is not a no iron fabric. Sure wish C&B would take the leap even it if would raise the prices. Rated 2 out of 5 by Central New Yorker from Not my style This would be a cool, pretty blouse to wear, but I’m returning it because it has too much white space in the pattern. I’m very fair skinned and I need to wear more color. I’m sorry that I cannot help anymore except for leaving my own fashion rule. Rated 4 out of 5 by NM Red from Pretty spring blouse I like the pattern and colors in this shirt and find the white background to be flattering to my complexion. It looks fresh and upbeat and goes with many colors. The only drawback is that it needs a little ironing after washing to make it look crisp. Rated 5 out of 5 by tuscdeb from I've been looking for this This is almost 100% cotton and has a nice weight to it (not stiff and not flimsy). The fit is perfect - not tight and nicely fitted.. I have been looking for a shirt like this for a while and haven't been able to find a nice one. The print is bright and cheerful. I liked it so much I bought two more. Rated 5 out of 5 by BarbRN76 from Love the fit! I bought this because I loved the print. It is as beautiful as the picture if not not more so. Fits perfect. Sleeves are not binding which is a problem I ha e with a lot of sleeves blouses and I will not wear sleeveless because of my "bat wings". Rated 5 out of 5 by Judy Lynn from Colorful and Fun! I bought the deep rose colored pants and paired it with this colorful blouse. I like the sleeve option (longer or buttoned), and the colorful pattern. The multi colors will offer multiple options with other pants or capris. Cute blouse! Rated 5 out of 5 by GmaS6 from What a cute blouse! This blouse is so cute ang Spring like! I love the colors and found skimmers to match. It’s very easy to change up too by wearing it open with a cute tank underneath.